How can I point my email elsewhere? You can point email towards an external mail server by changing the MX records of the domain name within the Advanced DNS section of your control panel. When pointing your domain name towards an external mail platform, your email supplier will provide you with an MX record. This will look similar to the following: aspmx.l.google.com . To view or edit your advanced DNS settings follow the steps below. A list of your domain names will appear. Click on the domain you would like to set up advanced DNS on. A list of your DNS records will be shown, scroll down to the the MX records section. Points To: Enter the name of the mail server you would like to send email to. For example mail.ralphsdomain.com. Priority This sets the order in which servers will attempt to send email to your domain name. The lower the number the higher the priority. Changing priorities will not increase the speed in which email is delivered, or make email more likely to bypass any spam filters. To ensure email is sent to your new MX record a priority should be set that is higher (ie a lower number) than any existing MX records. 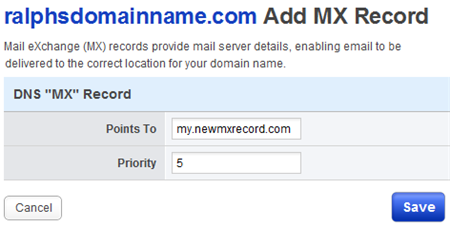 A priority of 5 would be suitable in this example, because the existing MX record forralphsdomainname.com has a priority of 10. 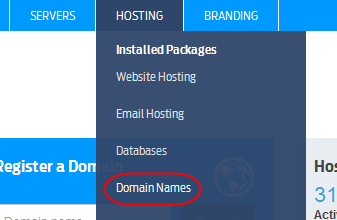 At this stage there will be 2 MX records associated with your domain name. One with a priority of 5 which you have just created, and one which we have previously set up for you with a priority of 10. Emails will now be sent to your new MX record. In the event of any failure, emails will be diverted to our mail platform. However, unless these email addresses are set up within your control panel this MX record will not work In most cases it’s prudent to remove the MX record that you don’t need. Click Remove next to the redundant MX record that you are not using and follow the onscreen instructions. The addition of multiple MX records is designed purely to enable some fault tolerance within your email, it does not increase the speed in which email is delivered, or make email more likely to bypass any spam filters. The purpose is that if your main mailserver should fail for any reason, your emails will be directed to the next mail server in the list and so on. To set multiple MX records, just follow steps 1-6 above, adding each record required in turn. Remembering to remove any MX records that are no longer required. Using the Advanced DNS settings you can create multiple MX records within your account. The MX record that will be used will depend upon the priorities set on each record. The MX record with the highest priority will be used in the first instance. If, for any reason, this server is unresponsive, the MX record with the next highest priority is chosen and email is sent to this server. Using multiple MX records in this was can add fault tolerance to your email records, but can cause some issues if miss-understood. In the following example, all email will be sent to my.newmxrecord.com, unless the mailserver is unresponsive, in which case email will be sent to mailserver.ralphsdomainname.com. If there are more than one MX records sharing the same priority the email server responsible for sending email to your domain name will randomly select which server to use. As a result you will receive some email at one MX record, and some email at the other MX record. If you are administering your own email server, you may need to create your own MX records for use. As MX records are qualified domain names that will resolve across the internet each MX record will also have an A record that will point towards the email server. 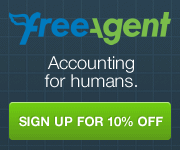 This section is only applicable if you are creating your own MX records. If you are using third party MX records, the third party will have already created corresponding A records on their domain name. If you look in the A record section, you will also see a corresponding A record, that will map the MX record towards the IP address of our mail platform. 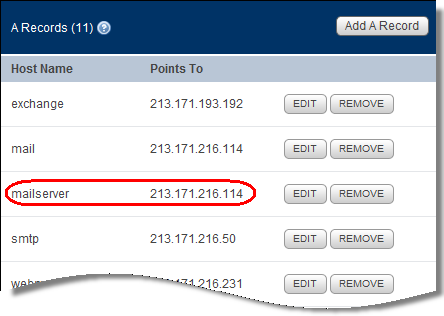 This ensures that the MX record resolves to the IP address of the email server (213.171.2166.114).